THE STORE LOADS SLOWLY, SO BE PATIENT. This book focuses on the star knowledge that was imparted to the Dogon people by the Nummo, who lived in the Solar System before humanity. Symbolism suggests they came from Mars and may have been associated with the Alpha Centauri System. The main purpose of the Dogon religion was to warn humanity about the fail-safes embedded into the Universe by a protector, creator entity. The Nummo were unaware of these fail-safes when they carried out an experiment that destroyed life on Mars, and ultimately left our Solar System with only one Sun. According to the Dogon, all aspects of life are interconnected and associated with suns. The loss of our second Sun caused some Nummo and eventually humans to be born mortal. Our lost Sun and immortality, are at the heart of the Dogon religion. The Dogon’s teaching of astrophysics, with the use of simple concepts, will be described in detail and will set the stage for an understanding of what happened here. 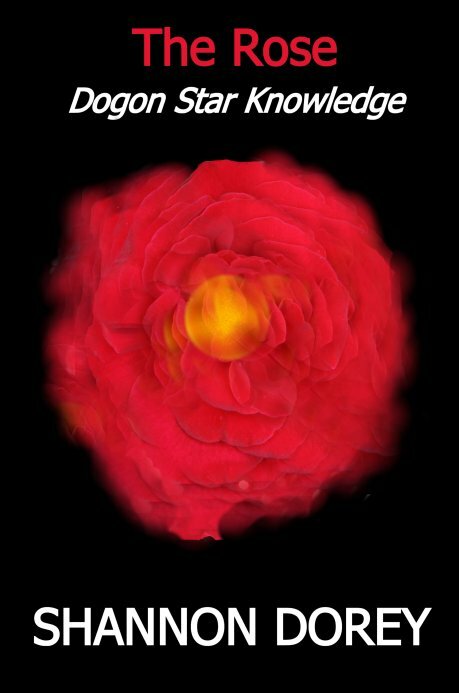 I used the title of “The Rose” for this book because the image of a red giant star expelling its gas looks like a red rose. For me this image was the impetus that sent me shooting through the cosmos. It forced me to study astronomy and to a lesser extent astrophysics. This one symbol allowed me to bring to light all of the dark secrets that were hidden there waiting to be unveiled. It was through the symbol of the rose that I was able to connect many ancient groups and beliefs, which are rooted in this one tragic, cosmic event. A red giant star is at the heart and soul of the Dogon religion and other ancient religions. My research reveals that it is the basis for all ancient myths about swallowing, spinning, hunting, sacrifice, and regeneration. I believe that all religions emanate from knowledge about astrophysics that was imparted to humanity by the Nummo. The Dogon people were still living in their oral culture right up until the time Griaule recorded these inner teachings taught to him by the Dogon elder Ogotemmêli. I believe that this oral record written down by Marcel Griaule in 1946 and published in 1948 under the French title, Dieu d’Eau (Conversations with Ogotemmêli), is the most important historical document in the world today. The fact that most scholars don’t understand the symbolism in this document doesn’t negate its significance. Even though Marcel Griaule lacked the scientific knowledge to comprehend the genetic engineering, alien beings and astrophysics described to him by Ogotemmêli, today we are able to understand many of the symbols he recorded. Other Dogon beliefs recorded by Marcel Griaule and Germaine Dieterlen in The Pale Fox, (French version Le Renard Pâle) are things that scientists have just discovered in the past few years thanks to the Hubble Space Telescope. This book provides the reader with an understanding of Dogon cosmology and explains why this record was left for us by the Nummo and why it is so important. To purchase The Rose go to Buy Book. After seventeen years of research and four books I can say with confidence that the Dogon didn’t just have basic knowledge of astronomy, they had advanced knowledge. This knowledge extended into astrophysics, which was an intricate part of their entire religious system. In order to understand Dogon cosmology, it is necessary to understand some basic knowledge about suns because suns are at the very heart of everything. Most of us don’t know a lot about astronomy or astrophysics so I will try to give you a very basic crash course on suns. You’ve probably heard of red giants, white dwarfs, black holes and neutron stars, well they are basically just different stages in the lives of suns. The Dogon considered compact stars like white dwarfs, neutron stars and black holes, male symbols and associated with death. A main sequence star, like our Sun, was a female symbol. Red giant stars were pregnant suns and were likewise female. It was because of these associations that the Dogon believed that suns were hermaphrodites. Suns were either male or female, depending on the stage it was in at any particular moment. It might be better to understand the Dogon’s androgynous perception of a sun if we use our Sun as an example. Our Sun was born about 4.6 billion years ago and has enough nuclear fuel to stay as it is now for around another 5 billion years. Because our Sun is in its main sequence phase, the Dogon identified it as a female star. When our Sun is around 9.6 billion years old, it will become a red giant star and begin to expand dramatically. In Dogon cosmology, this stage of our Sun will be its pregnant phase. In its red giant or pregnant phase, our Sun’s radius will expand to a size that in our Solar System might be comparable to the orbit of the Earth. Scientists aren’t certain yet if the Earth will be engulfed by our Sun at that time but what they do speculate is that Mercury and Venus will be swallowed by the Sun and all life will be destroyed on Earth. During our Sun’s red giant phase, planets will first be swallowed and then regurgitated in the form of gas and dust that will be blown away as the star expands into space.” A nebula will eventually form from all of the gas and dust blown away from our Sun. It is in nebulae, which are considered stellar nurseries, where new planets and stars are created from dying suns. This is why the Dogon perceived red giant stars to be pregnant suns and why they were symbols of both death and regeneration. Once the gas and dust is blown away from our Sun, it will become a white dwarf star, a dead sun and a male star. Because our Sun will eventually die and become a white dwarf star, the Dogon believed that the Sun was a hermaphrodite. To finish reading Chapter I go to The Rose: Dogon Star Knowledge or buy The Rose at Buy Book. Shannon Dorey is a Canadian author best known for her research on the African Dogon people. She is a graduate of Trent University in Peterborough, Ontario, Canada with a combined English and History degree. Her interests were expanded to religious studies after studying the New Testament at the University of Windsor in 1991. Based on the work of ethnographers Marcel Griaule and Germaine Dieterlen, Dorey has written four books analyzing the symbols found in the Dogon religion. In The Master of Speech, published in 2002, Dorey associated the Dogon symbols with genetics and biological engineering. In The Nummo, published in 2004, Dorey hypothesized that the Dogon religion was an extremely ancient oral tradition with traces of it found in most ancient religions of the world. In Day of the Fish, published in 2012, she compared the Nummo, described by the Dogon elder Ogotemmêli, to the goddesses of the Neolithic period as defined by the Lithuanian-American archeologist, Marija Gimbutas. In 2016, Dorey published The Rose, associating Dogon symbols with knowledge about red giant stars and other aspects of astrophysics. Dorey has written numerous articles on the Dogon religion including one for New Dawn magazine in 2010, which compared the Australian Rainbow Serpent to the Dogon Nummo, who were also described as being rainbow serpents.